“November comes…. 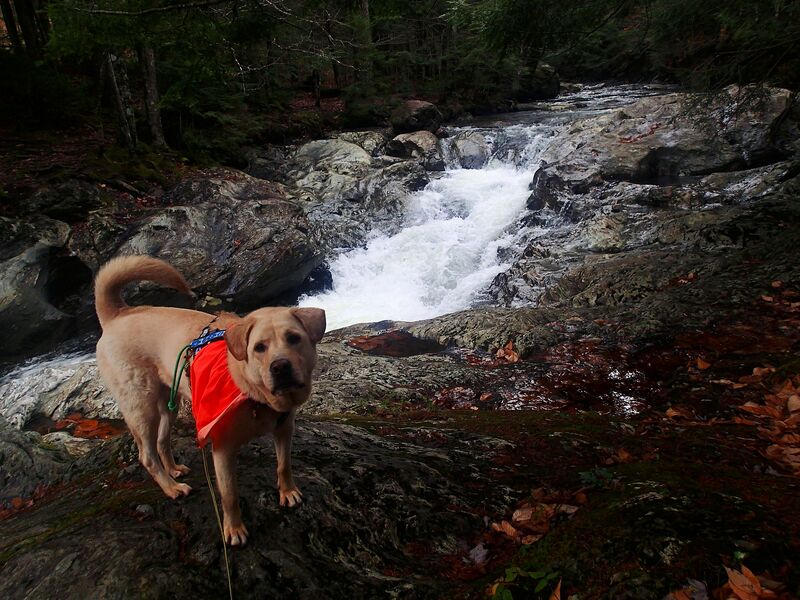 And November goes, With the last red berries… And the first white snows…” Elizabeth Coatsworth | Vermont Paddle Pups! October is done…the canoe is packed up, and decisions are being made regarding upgrading our fleet of snowshoes. 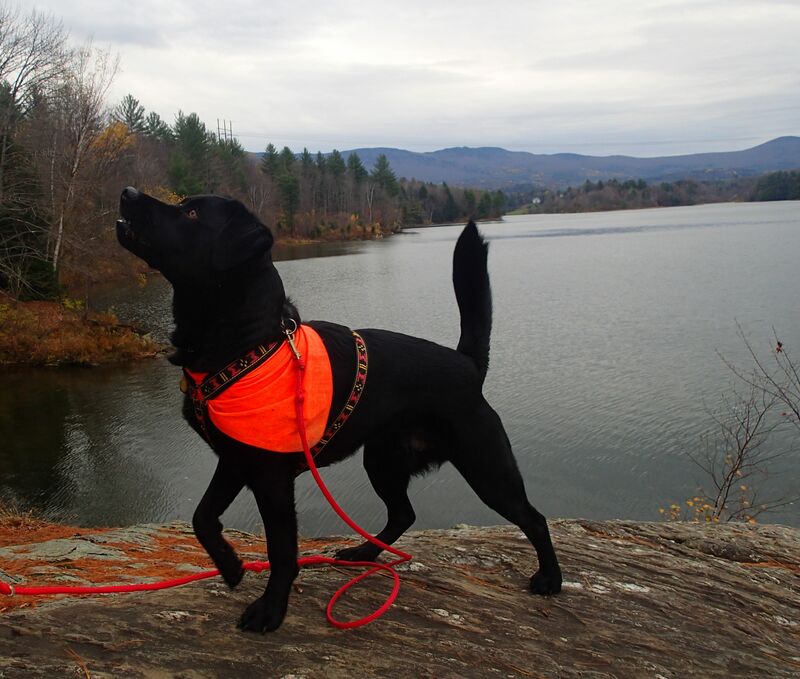 We are minimalists when it comes to Halloween, but we did carve a pumpkin..the Vermont Paddle Pups Pumpkin! With the arrival of November comes an increased awareness of when, and where we hike…always alert to the possibility of encountering hunters in the woods. 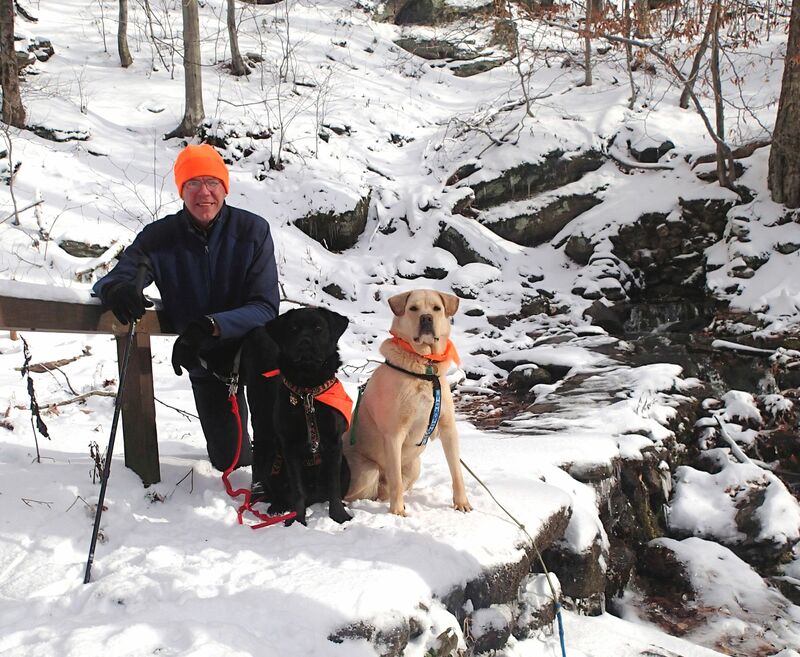 Orange bandannas for dogs, orange hats and vests for us…and we avoid the more popular hunting areas. Darkness also comes early (yuk)…so we use reflective gear and illuminated flashers when the dogs go out with us in the dark. 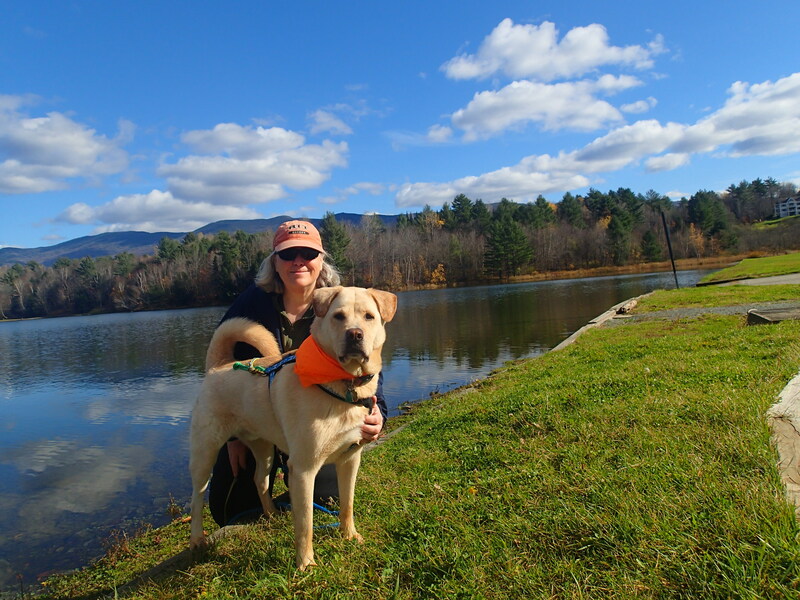 We were fortunate to win a reflective dog vest and scarf from Hurtta, so we look forward to putting those to good use! At Waterbury Reservoir…tress are brown, and grass will not be this green much longer! The first weekend of November, we celebrated Edgar’s 3rd birthday… a yummy dog cake, made with beef bouillion, peanut butter,and Buddy Biscuits…YUMMY! For his birthday hike, we went to Picnic Rock, but this time, we did not paddle there, but rather took a short land-hike. 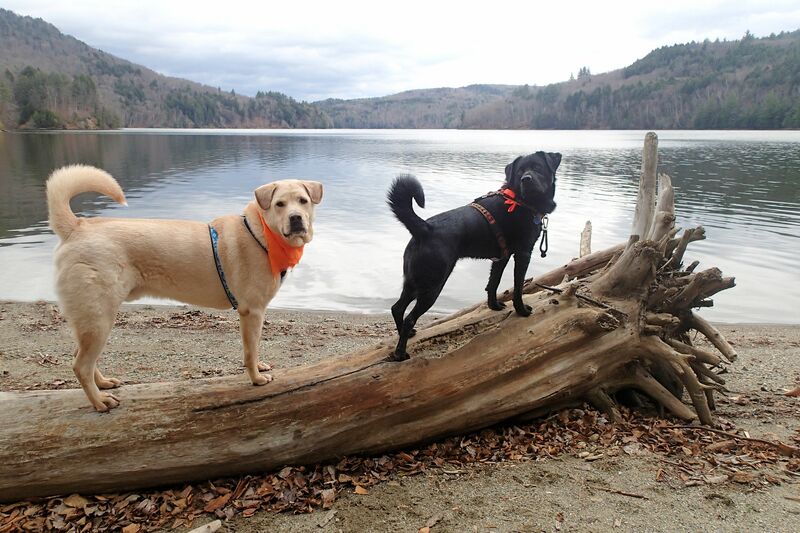 Both dogs had a good time, and were impressed by a young black lab who was leaping off the rocks into the water. I was very brave one day, and took Edgar for a pre-season bikejor jaunt. He did a great job! He remained (pretty much) on trail, and kept up a pretty good pace…Next time out, I’ll take some photos. We also took a short day trip to Montreal; crossing the border was a non-issue, as we had both dogs’ medical files with us, and were only required to show proof of rabies vaccination. 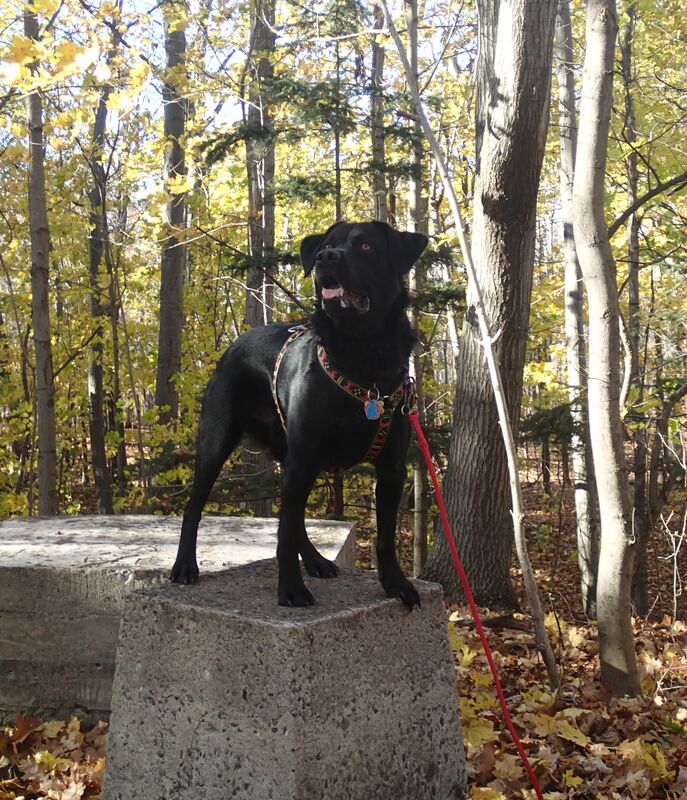 Our country dogs played city dogs for a day, hiking on a city park high on Mont Royal…lots of other dogs, and over 80% were following the leash requirement. Yay! 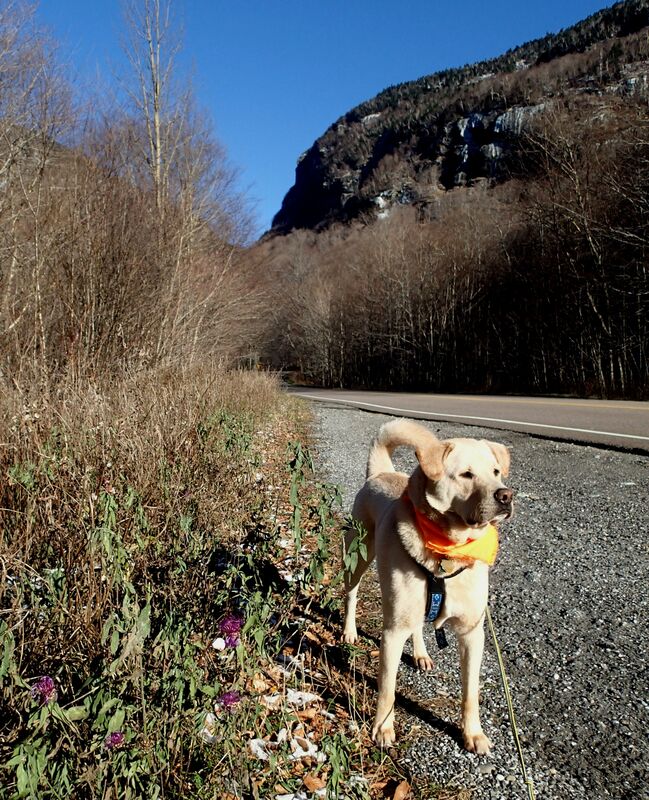 On 11/03/14, the Notch Road closed, due to icy conditions at its highest point . This section of state highway is closed to traffic in the winter, as it is a steep, windy,and narrow road, that cannot be plowed in the winter months. Since the forecast was for warming temperatures later in the week, I decided to take advantage of this temporary closure, and head up there with Griff. There was some snow and ice, but still a few remnants of fall color, and even some purple along the roadside. Sure enough, the road re-opened the next day…but alas, on 11/07 we received actual snow…now it looks as though this popular destination for skiers, hikers, ice climbers, and hammerhead sledders may remain closed to cars until May! 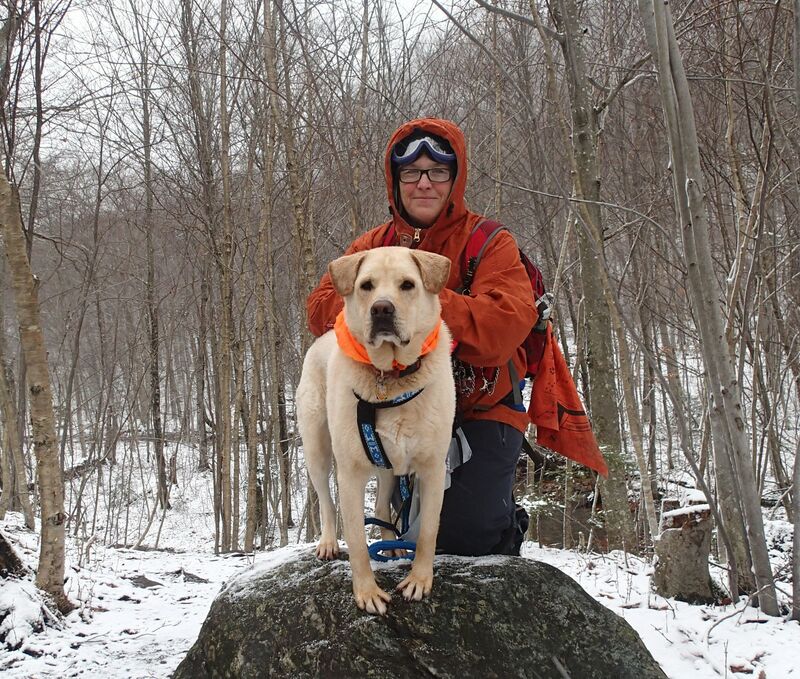 Griff and I found blowing snow, biting wind, and easy hiking! The next day, we took both dogs up into the Notch. Cold temps, but the sun was trying to peek through the clouds, and for the first hour or so, we saw only one other user, a die-hard X-C skier. There were 4-5 inches of snow, and ice on the roadway/trail…both dogs loved nosing into the snow, and running along the soft white ground. Along a flowing, icy stream…. While sitting at the pull-out off the road where we took some photos,our dogs were rambunctiously approached by two 6-8 month old lab pups. I asked the owners to “call your dogs,please”, and of course, what followed was multiple “here Rover, Rover come, No Rover, come Rover etc..” as the two interlopers ran all around our dogs, one even picking up Griff’s lead in it’s mouth…Griff did not take kindly to that! The owners seemed a bit miffed at us, when I suggested that they practice recall before taking the dogs off leash at a popular dog hiking area. 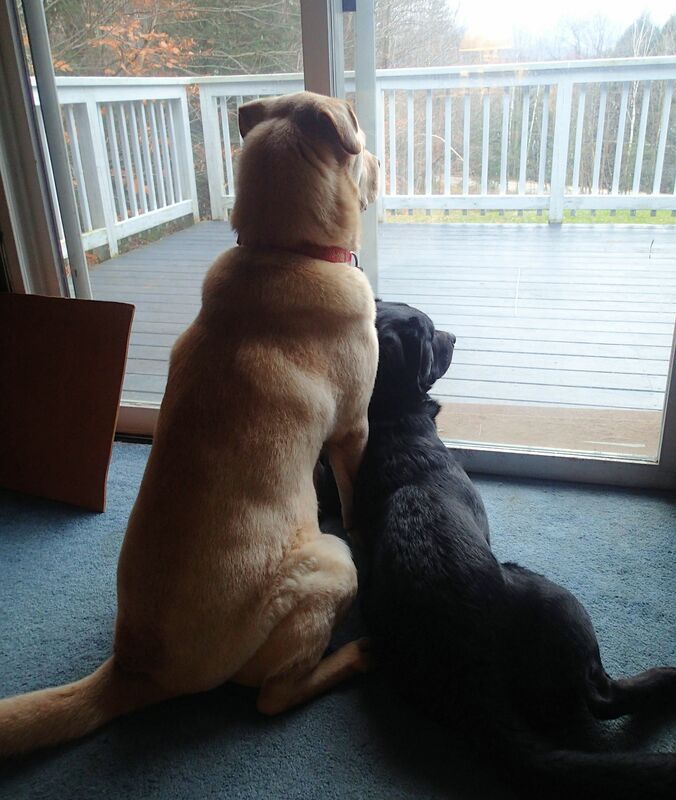 Thankfully, our dogs are not aggressive, or these pups (and owners) might have learned a very tough lesson. On our hike out, we encountered quite a few dogs, on leash and off…no problems with those dogs! We ended the weekend with a hike to a local state park, on the reservoir where we paddle. We checked out the camping spots, and took the dogs to the beach, where they are not allowed during operating season. It was in the 40’s, overcast, and not a bit of snow to be seen. 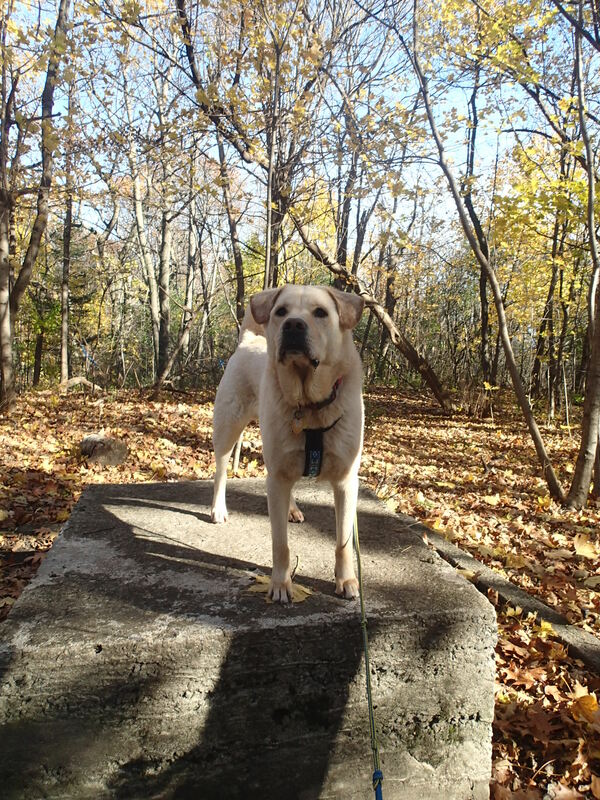 Would have been a great day, if not for my losing my cell phone, somehow, somewhere….unfortunately, unlike my previous dog, a trained police K-9, neither of our dogs are accomplished trackers! And now we deal with the diminishing daylight, increasing cold, and unpredictable, and often gloomy mid-November weather. As always, keeping active with the dogs is a key to survival!